The perfect herb to grow indoors is ginger. It loves partial sunlight, it's very low – maintenance, and you can use parts of it at a time, leaving the rest in the soil to continue growing. And, it's very delicious! Really, we couldn't find any reason why not to grow ginger inside. Ginger doesn't tolerate frost and it takes 10 months to mature. You'd be better off growing ginger in a pot indoors and bringing it outside in the summertime, if you live in a place where it gets chilly in the winter. Ginger is one of those miraculous plants that grows well in partial to full shade, which makes it ideal for growing in your home, where most people don't have full sun pouring on their windows all day long. It is good because little bits of the ginger root can be removed while it continues to grow. And those little bits of ginger can be used for herbal remedies, brewing tea or for cooking. The best ginger for planting should be purchased from a seed catalog or garden center. You'll be even more lucky if you can get ginger seed that was meant to be planted. However, ginger can be hard to find from garden suppliers, especially locally. Ginger purchased from the produce department of your local grocery store can be used to grow a plant, but without any great results. To keep it from sprouting before it's purchased, gocery store ginger is often sprayed with a growth inhibitor. That inhibitor also keeps it from sprouting when you stick it in a pot of soil. Grocery store ginger also could be coated in fungicides and pesticides. The truth is, you have no idea what's on it. We've heard of grocery store ginger growing just fine, and we've heard of it sitting in a pot forever and never budging. Be sure to soak it in water overnight, if you do purchase your ginger from the grocery store, to remove as much growth inhibitor as you can. The root that you choose to plant shouldn't be old and shriveled, but it should be plump with tight skin. It should have several eye buds on it (bumps that look like potato eyes) and even better, if they're already a little green. If your root has produced several eye buds, they can be cut and each bud can be placed in a separate pot to produce several plants. Ginger loves shallow, wide pots, unlike most other houseplants. The roots grow horizontally so be sure the pot you choose will accommodate its growth. First of all, soak the ginger root overnight in warm water to get it ready for planting. Fill your pot with well draining but very rich potting soil. With the eye bud pointing up stick the ginger root in the soil and cover it with 1 – 2 inches of soil. Water it well. Place the ginger in a place that stays reasonably warm and doesn't get a lot of bright sunlight. Using a spray bottle, keep the soil moist or water it lightly. Ginger is a slow grower, after a few weeks you should see some shoots popping up out of the soil. Keep the plant warm and continue to water the plant regularly by misting it with a spray bottle. 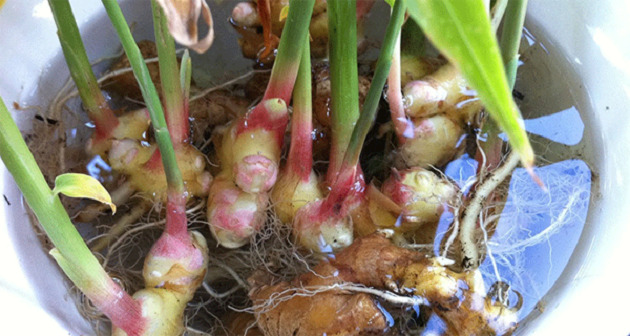 3 – 4 months after the growth begins, small pieces of ginger can be harvested. Move aside some of the soil to the edges of the pot and you should be able to find some rhizomes beneath the surface. Cut the needed amount off a finger at the edge of the pot and then return the soil to its place. Ginger will continue to produce roots, and as long as it is well cared for, it can be harvested in this way endlessly. You can uproot the entire plant and re – plant a few rhizomes to start the process over again, in case you need a larger harvest. Have you ever tried growing ginger inside? Share your experiences and tips with us!